Woman with a Parasol was painted outdoors, probably in a single session of several hours' duration. Claude Monet intended this to look like a casual family outing rather than an artificially arranged portrait, using pose and placement to suggest that his wife and son interrupted their stroll while he captured their likenesses. The brevity of the fictional moment portrayed here is conveyed by a repertory of animated brushstrokes of vibrant color, hallmarks of the style Monet was instrumental in forming. Bright sunlight shines from behind Camille to whiten the top of her parasol and the flowing cloth at her back, while colored reflections from the wildflowers below touch her front with yellow. SPECIAL NOTE : The painter will make the reproduction as close to the original oil painting as possible. 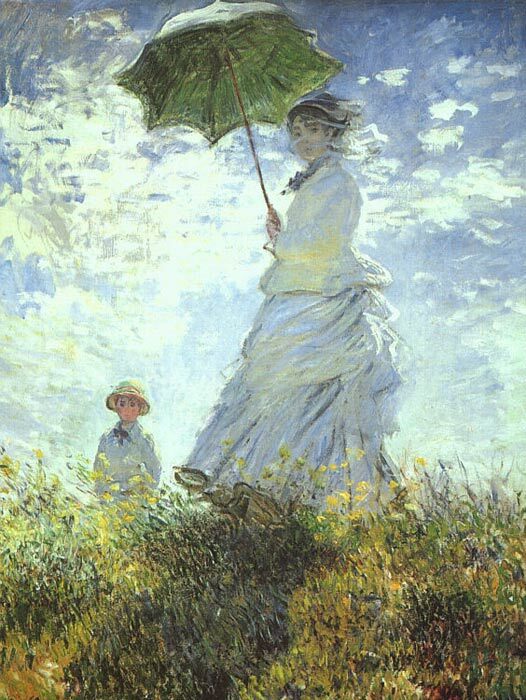 If you want your painting to alter from this likeness, please email us and " Woman with a Parasol, 1875 " will be reproduced according to your special requirements.